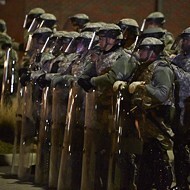 Police in St. Louis on November 25, the day after the grand jury delivered no indictment. See more photos here. 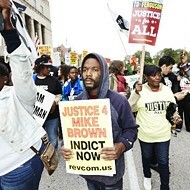 Editor's note: Tef Poe is an artist from the St. Louis area. Through powerful imagery and complicated honesty, he has earned a reputation as one of the best rappers telling the story of St. Louis, which is about much more than one place. Poe has been featured in music publications such as XXL and Urb Magazine. His project The Hero Killer was released on January 2 and was followed up this year by a full-length with DJ Burn One entitled Cheer For the Villain. Follow him on twitter @tefpoe. Get The Hero Killer here. This country has never witnessed a black-liberation front actually lifting our fists to fight back. There have been moments of violent encounters, but we as a community have yet to collectively declare the need to physically "fight." Over the course of history we have damaged property, devalued our own communities, flooded the streets with signs and direct actions, but America has not witnessed actual widespread physical retaliation for injustice. I think this is important to note. The arrogance of white supremacy would have you believe that we have actually physically attempted to fight back and have suffered defeat countless times. But look at photos of nationwide demonstrations, and you will see primarily unarmed people demonstrating. And, confusingly, the group that does not have the guns is deemed the violent contingent, while the armed-to-the-teeth police officers on the scene are viewed as the noble peacemakers. Tamir Rice was a twelve-year-old child playing in the park with a toy gun, much like I often did when I was his age. He was killed by a police officer with a history of unstable behavior. Tanisha Anderson and her family called the police for help, yet at the end of this saga she was left dead. Her family did not violently attack the individuals who killed her; they instead called for an ambulance. The actions of these police officers are defined as violence by those of us in the black community. In this year's protests, people in the streets have, for the most part, caused disruption without damaging property. But the narrative about buildings burning and young black people wearing gas masks is more entertaining. This also feeds the media images of the state flexing its military muscle and winning. All of these components are important because somewhere beneath it all the real story can come out. The truth is, black people are not liberated in America. We have never been liberated in America, and for the first time ever the sole objective of this resistance is liberation. The original thirteen colonies formed an army to counterattack their oppressors. The Revolutionary War was fought in the name of freedom for those colonies. When white brothers and sisters were murdered in the streets of New England, white forefathers grabbed their pistols and fought back. 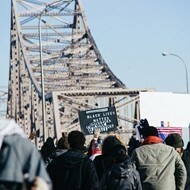 When our brothers and sisters are shot down by state-sanctioned violence, we gather through mass mobilizations. There is a drastic difference between these two forms of demonstration for freedom. One is indeed violent, and the other is often aggressive -- but does not physically strike back at its oppressor. Since the days of slavery we have taken a very submissive stance toward our master. Even when the slave knew he was physically stronger than the person cracking the whip, that slave would subdue his ego and allow himself to be struck. If he did not subdue his ego, the slave master would feel offended and see a need to kill him. The slaves are supposed to accept their deaths and not rise up to strike the master for this brutality. But in Ferguson we did not subdue our ego. We decided to push back. The slave master was offended and decided to attack us harder than he normally does. The purpose was to make an example out of us for the rest of the country to notice: "If blacks choose to rise up in your city, the response will look like this." The U.S. government has done this on a worldwide level: attack the oppressed, then accuse them of being the violent ones when they show even the slightest sign of discomfort or resistance. The black community has never declared "war" upon America. I urge you to think about the fact that you have never truly witnessed us organizing on a mass level with the intention of violently responding to state-sanctioned violence. We will no longer tuck our tails and hide from demonizing claims that we are "hyper-violent." Instead we will tell the rest of the world what is really taking place: White supremacy is violent by nature, and it maintains its choke-hold on planet Earth through that usage of violence. You have yet to truly see us "fight" back. So how do you spot the violent agitators at an otherwise peaceful protest? Look for the people who are holding the weapons. Sometimes it really is that simple.